Maeve Croghan's innovative interpretations of the nature painting genre have gained her much acclaim. Maeve grew up living every summer on a remote island in Northern Michigan. Here she developed a deep reverence for the lakes, woods, the surrounding lands and Nature. When Maeve first visited California many years ago, she was overwhelmed by the magnificence of California's natural beauty. She paints from a deep spiritual connection to the environment. Her love of the land is understood in her color filled paintings. Maeve's oil paintings are begun outside. She intensely observes the environment, becoming immersed in it as she paints. The paintings are finished in the studio from her memory and personal exploration and interpretation, without photo references. Maeve has been painting since she was 15. She studied at the San Francisco Art Institute [BFA program] for many years, as well as Reed College, the Portland Museum Art School, and the Corcoran School of Art. She has a BA from New College of California in 'Art and Education' focusing on Art and Social Change. Maeve has been the recipient of many prestigious juried awards. Her paintings have been shown in numerous galleries around the country, and in museum showings in Alaska, California, Oregon, New Mexico, Michigan and Japan. Most recently her paintings were chosen for exhibits at the Matsumoto Museum in Matsumoto, Japan, and for the Museum of the Living Artist in San Diego, Ca. Her paintings are featured on the wine labels of Castoro Cellars of Templeton, Ca. Her work is in prominent collections throughout the U.S., Canada, Europe, Japan and Mexico. Maeve's paintings have been chosen for multiple editions of the juried books, "ART of Northern California" & "American Art Collector", and chosen for the "Studio Visit" Art Journal. Her paintings are included in the book "Artists of the Northern Great Lakes". 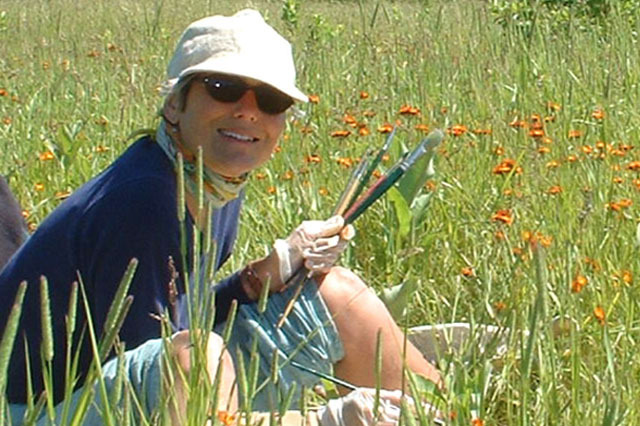 Maeve is the founder of the Mendocino Eco Artists, a professional group of artists who join together and have exhibits benefitting and bringing publicity for environmental causes and organizations. She is a founding member of the 'Mackinac 7' Artists group of Mackinac Island, Michigan, and on the 'Arts Committee' of the Mackinac Island Community Foundation. She has served on the Advisory Board of the Mendocino Art Center Exhibits Committee, and for the Mendocino Area Open Air Paint Out (MOPO). She is a long time member of the Mendocino Plein Air Painters,(PAPM). At The Hunters Point Shipyard Artists' Studios in San Francisco, Maeve organizes the Annual Holiday Art Show, and was formally on the Spring Open Studios Advisory Board. Maeve splits her painting time between Hunters Point Artists' Shipyard Artists' Studios Community, in San Francisco, CA., Mendocino, CA. and on Mackinac Island, MI. in the summertime. © 2019 Maeve Croghan. All rights reserved.